The second battle in our series of the American Civil War games in 3D sees the Union army under General Nathanial Lyon make a daring dawn raid on the Confederate forces. The Union are outnumbered more than two to one, but Lyon is banking on his more skilled men being able to win the day. Can the Confederates commanded by General Benjamin McCulloch stop this bold Union action? The game is quick to play in less than 1 hour, but it is very tactical and can be played again and again. It has a time limit of 18 bounds in which the Union must achieve their objective. Its design allows for a fast, fun and realistic game that gives a flavor of the American Civil War period. A simple chain of command solution adds intrigue to the game, keep the chain of command together and everything is fine, lose it and it could cost you the game? 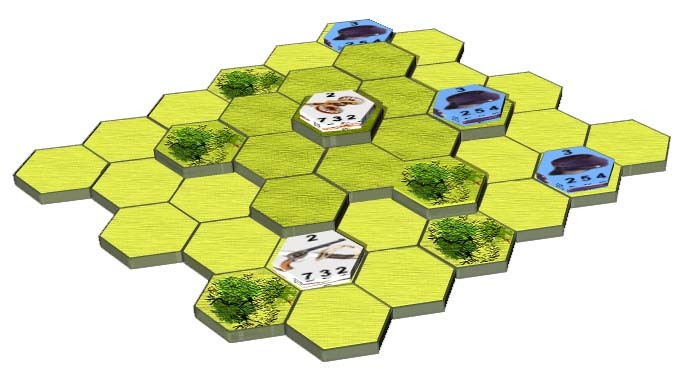 Combat is designed around the three factors that appear on the unit counters, these indicate the Range, Attack and Strength of the represented unit. You don’t even need any dice to play the game since a dice tile system is included with the game, but if you want to roll dice then it’s the simple six sided variety that you will require. Included with the download is the 3D Game Board in two quadrants, the Wilson’s Creek five page Battle Report, the Gaming Counters, a simple guide on how to build a 3D Game Board, the Brothers At Arms twenty page Rules Booklet with Playsheet, a twenty four hour Timeline Table and finally a set of Tile Dice. The game rules are fast and easy to learn and will be the same throughout the full series of American Civil War in 3D. Can you continue this great series of battles with another victory? 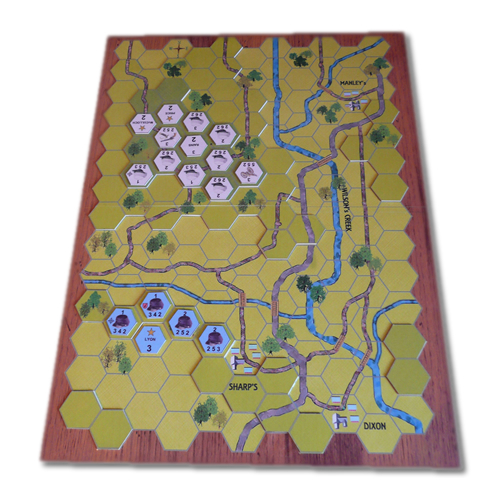 Play North or South in this the second of the American Civil War in 3D series of board games. Fort Donelson is next in the series and it comes with a continued play option that is dependent on the tactical objectives you win in this game. Scott Klamm 9 9 9 Great value and quality. It's inexpensive and you can make the pieces/board as high a quality as you want! Rules are simple enough that I can teach my 14-yr old to play together, but still lots of complexity in the actual playing. A winner here! Shaun Austin 10 9 10 Excellent Battle that gives you a fast , furious game. Hi-lights some of the special rules of the system and makes for a very enjoyable game. Highly recommended. DANIEL ROULEAU 9 10 8 Great components, clear rules, I really enjoy this series. George Thompson 10 10 10 This is an excellent design. One receives a lot of value for this price. The counters are impressive as well as the 3-D map concept.